Today I’m excited to share a guest post by reader DoriAnn Haskins, who also blogs at Baby Steps. She has read our book, Find Names for the Temple: A Step-by-Step Method for Success, and shared her experience with it. I’m delighted to hear of her success and I hope you enjoy reading it also! In June, I was called to be the new Lead Family History Consultant, which I was excited about, but also more than a little intimidated: my family has been members of the Church of Jesus Christ for a very long time; I count both early leaders and a number of faithful genealogists among my ancestors, and the easy research is long since done and gone. I’ve been poking my family tree for the past twenty years or so, trying to persuade it to produce temple names, but only once in all that time did I find a few names for a handful of sealings for one family. It was, as people say, a very special experience to take my own family names to the temple, but mostly, when people would talk about needing to go and do work for family members at the temple, I just felt left out: I knew there was people there to find, but I didn’t know how to find them. Between reading Find Names for the Temple: A Step-by-Step Method for Success by Nicole Dyer and Diana Elder, and some training from the Stake, things have changed: I have what I am confident will be the first of many temple cards printed out and ready to go, and I’ll be making the trip to the temple (it’s 3 hours from here) sometime in the next month or so. I can’t even say how excited I am to finally have the skills to be able to find these people that have been hiding in my tree! 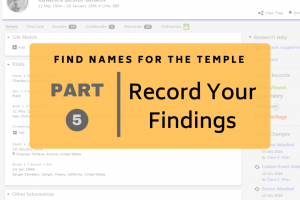 Finding Names for the Temple helped me both know what to look for when I do my research, and it also helped me learn to focus my efforts, so that I’m not chasing one rabbit hole after another: using the authors’ techniques, I’m able to do effective research, even in the small bits of time that I have in between being a homeschool mom and everything else that goes on around here. The very first page of their book, even before the Table of Contents, has a flowchart that shows a pattern for effective research, and this chart has revolutionized the way that I work. They categorize trees into “partial” trees (ones that have blank spaces where direct ancestors are still unknown), “full” trees (ones where the tree has been fully researched as far as direct ancestors), and “full with LDS ancestors”, and in the chapters that follow they do a great job of addressing how to work with all these types of trees. This has been great for me, since I see all these kinds of trees in my work as a consultant. It’s a short list, and the book isn’t long: only 103 pages. It’s written in an easy encouraging style that makes the whole process seem very doable. But for all that it’s an easy read, it’s also the kind of book with enough substance to keep you coming back. Right now, the part that I’m really digging into is chapter four’s discussion of how to research. The concept of a Research Objective, a narrow statement of my immediate research goal to keep me on track, has really transformed the way that I do things when I sit down to work on my family history. In addition, they talk about the importance of learning about location. I had never really done this before, but following the pattern that they lay out, I started learning about Randolph County, North Carolina –and quickly realized that the information I have has my Grandma Dicey being born there before the county existed: Randolph County was formed from Guilford County some 13 years after my ancestor is said to have been born there. Previously, it would have never occurred to me to check that kind of thing, and I would have entirely missed the inconsistency. Their website, Family Locket, is a treasure trove of resources for family research, including a fantastic podcast that I’m working my way through, a collection of articles and links about sharing family history and family history research with children (I’m particularly fond of this article about pretending to be farming ancestors), a blog, a class and a study group, and more: every time I visit, I feel like I’ve learned a little more. Reading this book has taught me some important things to improve my both my own research, and also improved and is still improving the things that I’m able to show my friends as I work with ward members in my calling. In the last three months, I’ve gone from being completely stumped as to how to find names for the temple, to not only being confident that it can be done, but more than a little amazed at how many research opportunities there are on my tree! It’s a complete 180 from where I was just a few months ago, feeling overwhelmed, stumped, and a little bit guilty for not doing enough. 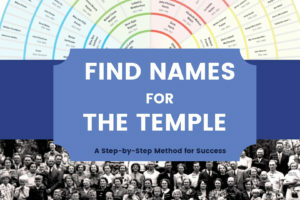 Finding Names for the Temple: A Step-by-Step Method for Success has been key in that transformation, and I absolutely recommend it: if you want to participate in family history work, and you want to find your own family names to take the temple, then this is the book for you. 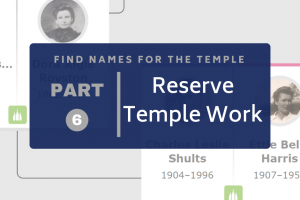 I have been stumbling along trying to get names for the temple. I have managed to get a few here and there. On the whole it has been frustrating and unfulfilling. Would like to do more if i knew how. You are not the only one who feels that way. I’d love to work with you to help you learn how to find names in an organized way!! I’ll email you.